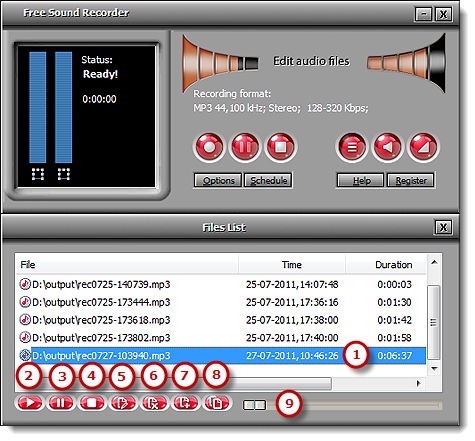 Tutorial – How to Manage the Recordings in File List? 1. Detailed file information of the listed files is displayed. 2. Play selected file or directly press Ctrl+P to play. 3. Pause playing the file. 4. Stop playback. “Ctrl+E” to activate Cool Record Edit Pro. 5. Edit the selected file by using Cool Record Edit Pro. 6. Remove one or more listed files. 7. Add files to the list. 9. Drag the slider on the playback bar to the position you want.